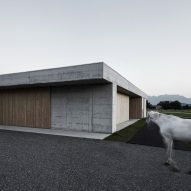 A large wooden door forms the entrance to this concrete live-in equine veterinary practice in western Austria, which was designed by Marte.Marte Architects. 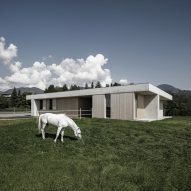 Feldkirch-based practice Marte.Marte Architects was tasked with creating one building suited to the vet's work and life, including an in-house pharmacy, treatment rooms, laboratory and stables, as well as private living quarters. 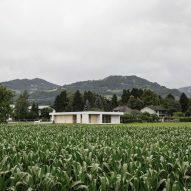 Located on a site where Rankweil village meets the Rhine Valley, Griss Equine Veterinary Practice is contained in a single-storey boxy building measuring 27 metres by 19 metres. A walkway cuts through it to separate the working area from the accommodation wing. 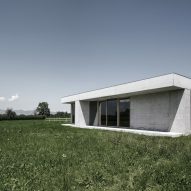 Four concrete walls of different lengths act as a divisions between different areas within the building and support the thick, flat roof – a contrast to the Alpstein peaks that rise behind it. 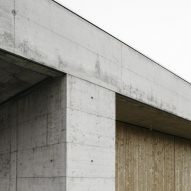 Prefabricated walls of wood make up the rest of the facade, filling in the gaps between the concrete walls. This includes a large sliding door that fronts the practice, allowing clients and their horses to enter straight into the examining room. 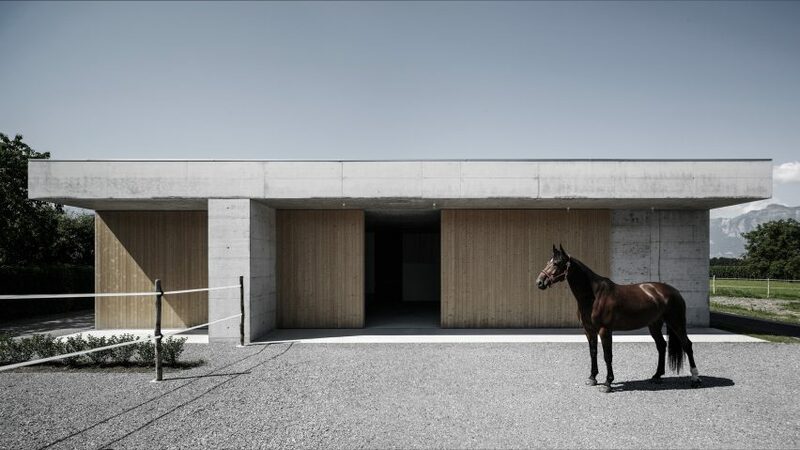 "The big open sliding door, which is part of the facade, reveals the centre of the equine practice: the examining room," said the architects. "All the practice's other rooms are grouped around this central point." The pharmacy, laboratory and office area occupy the east wing. 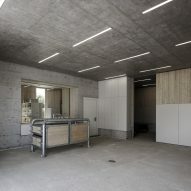 The concrete walls and roof remain exposed inside, but the floors, built-in furniture and wall coverings are made of silver fir. "The warm and soft effect of this wood is an appealing contrast to the hard and rather cool concrete," explained the architects. Three stables on the other side of the building face the meadows, a round exercise pen and a small track for trotting. The stables have four-metre-high walls – double standard height – to allow plenty of room for fearful horses to rear up. The operating room and anaesthesia box to their rear are lined with black rubber safety mats. Across the walkway, the apartment is oriented to face southwest, away from the access road. An open-plan living and dining room features double-height sliding glass doors that open up to a veranda. The walls are set back from the edge of the roof to cover this outdoor area. Silver fir is used to line two of the walls in the apartment, covers the floor and forms storage cabinets. 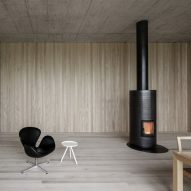 The space is furnished simply, with a black wood burning stove placed at the centre, a black chair and a wooden dining table. A narrow kitchen is placed to one side of the bathroom, while the bedroom is located on the other side. Other horse-related projects from the Dezeen archives include an equestrian centre in Portugal comprising four house-shaped structures, and a house in Mexico with a stable on its roof. Marte.Marte Architects has completed a number of residences in Austria, including a concrete house that overlooks the Rhine Valley, a steel-clad extension inspired by the towering fortress of fairy tale character Rapunzel and an Alpine holiday home made from coarse concrete that gives its walls a rocky appearance. Photography is by Marc Lins.